On this lovely spring day (read that with heavy irony), mittens don't seem out of place at all. I wish these babies were finished. I might be tempted to wear them. This is my first try at mittens using a simple pattern that was sent in the mail as part of an ad to subscribe to Knit Simple. 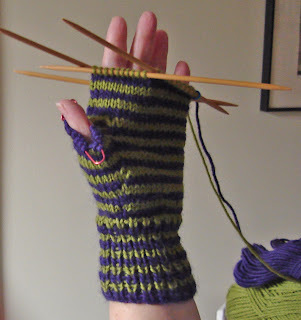 I don't like that mag, even though it is a Vogue publication, but I am happy to use their cute striped mitten pattern. The yarn is worsted weight leftovers: Brown Sheep Lamb's Pride in Clematis (more purple than it looks here) and Paton's Classic Merino in Leaf Green. The Lamb's Pride is a little heavier than the other, but together they get gauge. The needles are Crystal Palace double point bamboo #6 (US). I spent a fortune yesterday at my lys (Arcadia for you Chicagoans) buying sizes 4, 5, and 6 thinking I might need them for my further adventures with mittens. I already have 7 and 8 in Inox which I think are not too slippery. I think that mittens might be a more boring project than scarves and not as tailored to each recipient. But on the plus side, I can get into surface design if I want to and I can make a lot of them out of yarn I have on hand. I spent way too much on the scarves. Because many of the gift recipients are people I work with at the library, I especially like to use reference to the audiobook I was listening to in naming them. So this pair is called A Thousand Acres. If you really use your imagination you can see rows of crops in the stripes of the mitten. This is my second reading of this book, and I am liking it better this time because I am more used to Jane Smiley's plotlessness. Actually this one has a bit more plot than some of her others. Her observations of human interactions and motives are acute. Getting back to Arcardia, while I was shopping for needles yesterday I picked up some yarn to swatch. I want to re-knit the sweater I call Jilly (you can see it if you scroll down) in a firmer material than the cotton/silk blend I used originally. The yarn on the left is Tahki Bali, a bamboo tape in an aran/chunky weight. It shrank drastically in the blocking. It is also too shiny. The yarn on the right is Berroco Comfort - 100% synthetic. Yarn snob that I am, I would never dream of using an all synthetic yarn, although I have liked blends. But the quality of the yarn in the skein looked right for my purpose. I like the swatch as well. I am really tempted to knit the sweater in this yarn; it would cost less than $30 and would go in the washer and dryer.